A (reasonably) quick look at some of the more useful settings that the game doesn't draw much attention to. We’re going to start in the Settings menu. Push Escape (or click the cog in the top left corner of the port screen) to bring up the main menu, then click – surprise – Settings. Then we’re after the Controls page. There are a couple of things here that we want to tweak. Firstly, we’re going to switch the Alternative interface mode to Full. This is the equivalent of putting a brick on the Alt key and the game will always display the extra information – player names, health pools and what ship they’re driving as well as range and shell time of flight to your current aiming point – as a result. The collision avoidance system is something is something I normally switch off, but you might want it on for your first few games. It’s exactly what it sounds like, automatically adjusting the helm if the game thinks you’re about to run into terrain. It's handy when you're learning the game, but eventually I just found it to be a nuisance. Besides, there are times when running aground is the alternative to running into torpedoes or heavy gunfire…and executing a tactical beaching doesn’t damage the ship. 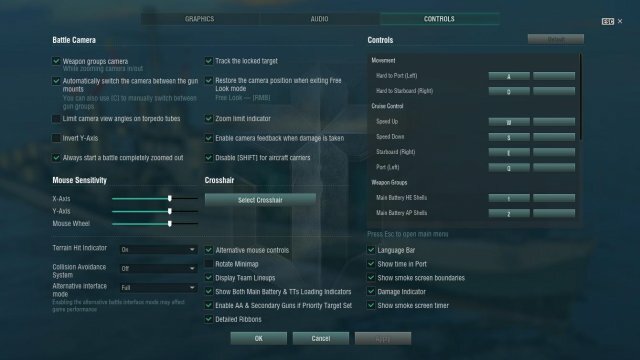 Alternative mouse controls – this only applies to carriers. When off, it’s in Command and Conquer style – left click gives orders, left click and drag selects plane groups. When on, you have a more Starcraft style with the right mouse button giving orders instead. 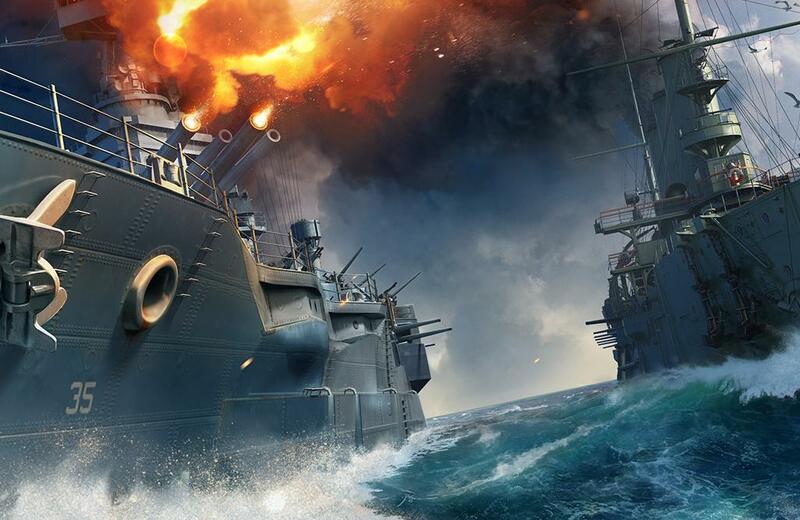 Personal taste and since carriers don’t start until Tier 4, not an immediate decision. Personally I prefer to have this on, since you can’t accidentally deselect a bomber group while trying to order an attack run. Rotate minimap does exactly what it says on the tin. When off, the map is fixed and your ship icon rotates as you turn. Turn it on and your ship becomes the fixed point with the map (and everything on it) rotating around you. Personal taste, really. I’m used to a fixed map so I leave it off. Display team lineups puts a team list in the top corners – friendlies on the left, enemies on the right - showing who’s sunk, who’s still in the fight, what kind of ship they’re driving (you’ll get good at recognising silhouettes) and how many kills they’ve racked up during the game. Not essential, but a handy quick reference and I tend to have it on most of the time. Show Both Main Battery and TT loading indicators is one you definitely want to have ON since it saves you having to switch between guns and torpedoes to check on reload progress. Detailed Ribbons is another one to switch ON. This breaks down the "Hit” ribbon into Penetration, Overpenetration, Bounce and Shatter. 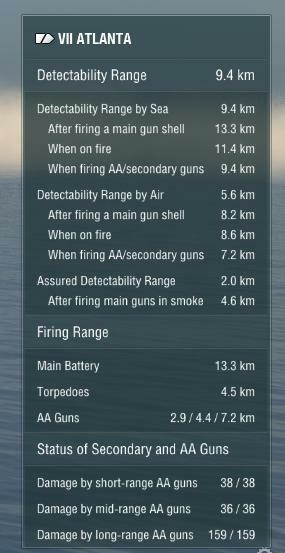 This is vitally important information for gunnery because it tells you what your shells are doing when they hit the target. Gunnery needs a guide all of its own but for the moment, let’s just say that if you’re seeing a lot of bounces and shatters then you need to adjust something about your shooting. Show time in Port is another one that does exactly what it says on the tin, displaying a small clock in the lower right hand corner of the port screen when switched on. Handy and doesn’t get in the way. Damage indicator – This puts a running total of how much damage you’ve done to the enemy in the top right hand corner. It actually has a use beyond keeping score since there’s no visual cue for flooding damage. Except this counter, which will be steadily ticking up. I normally have this on. The other thing we need to look at in the settings is the Select Crosshair option. World of Warships comes with a lot of crosshair options…and a lot of those are improvements on the default static type 2. In particular the spiderweb sights (static types 7 to 12) have angled lines that are extremely handy for aiming at angled targets and when in the spotter plane view. Possibly the most useful, however, is the dynamic gunsight. This looks similar to the basic sights, but automatically adjusts with zoom level so that a given point on the scale is always aimed at the same spot. Additionally the markers are actually useful for calculating lead – one division roughly corresponds to 1 second of shell flight for a target doing 30 knots perpendicular to the sight. This is only an approximation – it starts breaking down at longer ranges and larger angles - but even then it’s a good starting point. One control that's worth knowing and isn't widely mentioned is the P key. This toggles flak and secondary guns on and off. Why would you want to switch guns off? 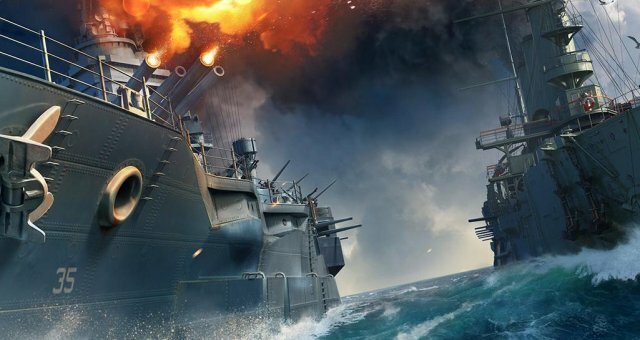 Because most destroyers – especially at mid to high tiers – have flak that’s relatively ineffective but that reaches beyond their air detection range. Which means that you can be tiptoeing along, all nice and sneaky, and then some plane wanders within flak range – but not close enough to spot you. Until your gunners open fire. At which point the plane will spot you, because firing flak guns carries a stealth penalty. And then the entire enemy team knows where you are. Oh, and you probably won’t shoot down the offending aircraft either. It’s safer…much safer…just to muzzle the flak guns with P and tiptoe on past. The H key: Because knowing is half the battle! Another handy button is H. Holding this pops up a status readout – detection ranges, flak auras and all kinds of other occasionally-useful stuff about your ship. Lastly we have the minimap options. These are accessed in battle by holding Ctrl to enable the mouse cursor and then left clicking the cog icon above the minimap (and yes, you have to click on the cog despite the menu apparently popping up when you put the cursor over it). Enable everything, and crank the water transparency back to about 50-75% so you don’t have a massive blind spot on your screen. This can be a little cluttered at first…but having detection, sensor and weapon ranges clearly overlaid on the map is invaluable. You'll also want to tap the + key on the number pad a few times to increase the size of the minimap and make it more easily readable at a glance. 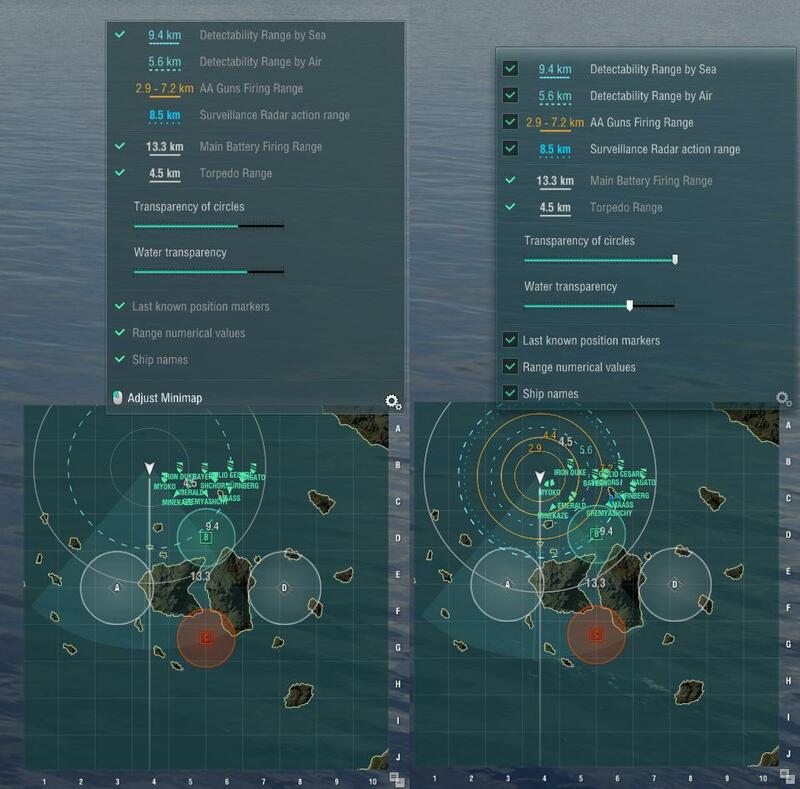 Note the difference - with the options enabled I can see at a glance which ships are where, how far out the Atlanta's surface radar will sweep, how far out I can be seen from both sea and air and which friendlies are inside my flak cover.